The Pisces December 2015 Horoscope predicts that personal efforts and independence will dominate this month. Planetary strength is in the Eastern half of the birth chart for the Pisceans. Decide what you want in life and follow up with hard work. Success will be yours. Cooperation from others will enhance your achievement. Planetary power is concentrated in the Northern sector of your horoscope in December 2015. This makes career and business more important over domestic and emotional concerns for the Pisces zodiac sign this month. Your diligence will help you grow in your profession in December 2015. Improving your knowledge related to your job or business will help you in moving ahead of others. You will travel extensively to expand the market for your products during this month. So be sure to overcome jet lag with these few tips. 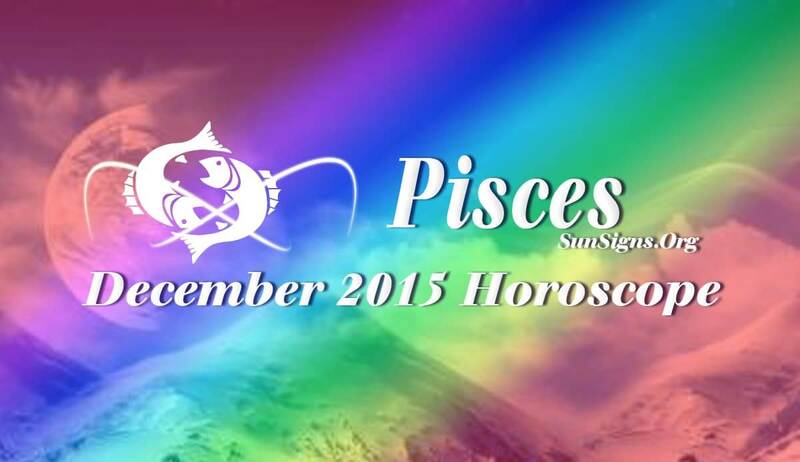 The December 2015 Pisces astrology predictions foretell that monetary situation will be volatile. More effort is required to generate money. Planetary aspects will make you aggressive and impatient. Proceed cautiously and be diplomatic while handling people. Love will be wonderful in December 2015 for people born under the sign of the Fish. There will be a conflict in your mind between pursuing a serious partnership or just dating for fun. This will become clear after 17th. Here are a few tips to win over your woman. You might not seriously think about getting pregnant this month. The Pisces December 2015 horoscope forecasts that your health will be delicate till the fourth week of the month. It requires prompt attention and lot of patience. Health shows marked improvement in the last week. Here are a few natural remedies for dehydration that can affect you this month.